November 8th it was the 35th time the Epoqu’Auto show opened the doors for 3 days in Lyon (France).Epoqu’Auto is the 2nd most important vintage car show in France, next to the Rétromobile in Paris, with over 50.000 visitors from all over Europe. No serious vintage car show in 2013 without a celebration of the 50 years Porsche 911. Nothing else in Lyon with a great support of the Porsche Museum that brought some important cars like the Jacky Ickx-Claude Brasseur Paris-Dakar Porsche 911, 1 of only 356 Porsche 997 Speedster and the Louise Pïech Porsche 911 Turbo. Another very special car was the Citroën DS21 that once belonged to the politicians General Charles de Gaulle and Georges Pompidou, former prime-minister and president of the republic France and a well-known Porsche 356 driver and enthusiast. The presidential limousine had a body by Henri Chapron. With a length of 6,53 meter, it was even 13cm taller than the presidential limousine of the USA. Georges Pompidou was an enthusiastic car driver used to own a Porsche 356 SC. More rare Porsches 911 at the show in Lyon were the 934-Model car 1:43, driven by Didier Pironi and Bob Wollek and the french female driver Marie-Claude Beaumont at the 1976 Le Mans 24hours.Last but not least, a beautiful Porsche 924 S (Photo 13) was exhibited on the Porsche 924, 944 and 968 Club de France-Stand. Maybe rather unknown to many of you, Renault-Classic ambassador Jean Ragnotti had a stunning career as a rally-pilot in the 80s, being 9 times the National Champion of France. Most famous is his victory in the prestigious Rally Monte-Carlo in 1981 becoming the first turbo-winner. As you all know Walter Röhrl, currently frequently testing Porsches at the Nordschleife won this race in 1982 in a Opel Ascona 400. Exactly as Röhrl, Ragnotti drove the Le Mans 24hours several times, not unsuccessfully as he finished 4th consecutively in 1977 and 1978, bringing him class victory in 1977. 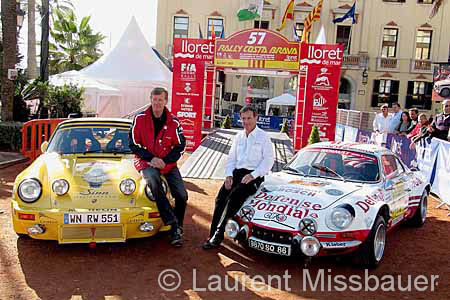 In 2010, both champions drove the Rally Costa Brava Historic, Ragnotti in a Renault Alpine A110 and Röhrl in a Porsche 911.